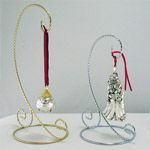 The Woodbury Pewter Pineapple Christmas ornament is unique among most Christmas ornament. 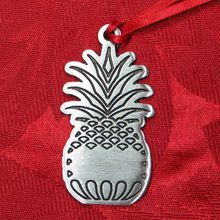 Crafted from tarnish-resistant pewter, this ornament features a classic pineapple, a symbol of hospitality. 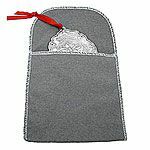 This ornament would be a wonderful hostess gift any time of year or used to remember a special event or vacation. Gift boxed with red ribbon included, and proudly made in the USA, this item is sure to become a treasured heirloom for anyone, young or old. The Pineapple ornament features a small space on one side for engraving just the right size for a monogram, short name or date. The engraving space measures 1" by 1-1/2". The ornament overall measures 2-1/2" tall. Add an ornament to your cart for engraving options. This ornament is not dated. 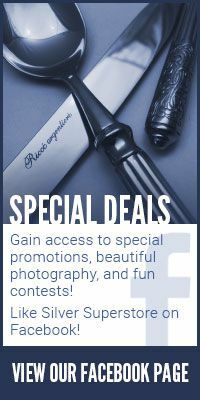 Personalize this item with an engraving for just $7.75. Simply add it to your Shopping Cart, and click on the engraving option listed below the item. Space allows for engraving on one side for a small name, monogram or date. Woodbury Pewterers was founded in 1952, in the town of Woodbury, CT. by Ruth Holbrook and Lee R. Titcomb. The original location was a small blacksmith shop located next to the historic Hurd House in the center of town. In 1967, the business was re-located to its current location. Each piece of Woodbury Pewter is hand-crafted from the highest quality pewter using many of the same methods and tools that were used in the 18th and 19th centuries. Woodbury Pewter still remains a family owned and operated business with several second and third generation employees. All Woodbury Pewter is hand-crafted in Woodbury, Connecticut. 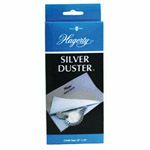 Master craftspeople using a wide variety of methods, carefully produce each piece of pewter with the skills and pride that is clearly apparent in every piece.